Flaunt beautiful art on your bags and clutches with Art Meets Fashion, a fashion label that creates all sorts of artwork and portraits on handbags. Art Meets Fashion has been started by Aarti Verma in 2010, who believes in creating unique fashion accessories that are customised to the T.
Though they offer gorgeous bags, they also have accessories that can be bought off them. We found chunky neckpieces that made us feel like Gatsby’s party were dull. 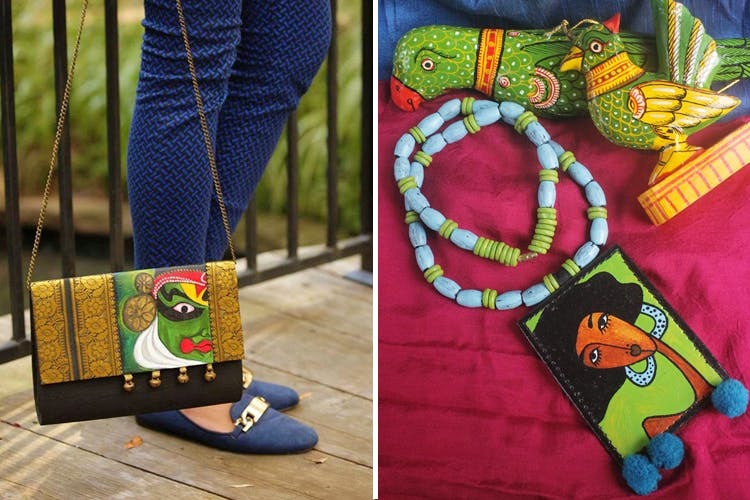 These start at INR 1,500 and the bags at INR 1,800, depending on the size and the kind of art that has been done on it. The intricate and absolutely gorgeous artwork that is handcrafted on the bags. From clutches to sling bags to tote bags, they do it all. All of these bags are handcrafted, and hand stitched. They’re dreamy and we love the effort that has gone into creating bags that go beyond your utilitarian usage. Find quirky Buddha, or the face of a Kathakali dancer all magnificent and out there. Our favourite, however, as the Frida Kahlo clutch – an ode to the feminist power and artist she was. The bags can be customised as well. All you need to do is get in touch with them over Facebook, or mail them at stainedcanvas@gmail.com. We’re thinking on the lines of getting our doggo’s face imprinted, so we can flaunt our little babies to everyone we meet. There’s nothing more whimsical than art colliding with fashion, and in this case, in such a beautiful way. Flaunt these clutches, make an artsy statement and be prepared to receive some massive attention coming your way. To buy, you can go to their Facebook here.